FCC net neutrality: Exclusive fast lanes could change the Internet entirely. Last Thursday, the FCC proposed authorizing Verizon to make an exclusive deal with MSNBC making it the exclusive premium news provider for everyone accessing the Internet through Verizon. Perhaps MSNBC’s website would load instantly, its video load smoothly, and none of it would count against your bandwidth cap. Other news sites would load slowly, and their use would count against your caps. OK, that proposal didn’t actually happen. But it could under the rules that FCC Chairman Tom Wheeler is trying to implement. Most of the coverage of the net neutrality debate has focused on the fact that the proposal would permit the creation of fast lanes. But what people have largely overlooked is that the rules would actually permit exclusive fast lanes—that is, the giant phone and cable companies would be able to anoint a monopoly in each industry for each of their networks. This despite the fact that Wheeler claims that he is trying to keep the Internet as it is today and to ban fast lanes and pay-to-play deals. That proposal would also permit Comcast to cut a deal with Apple making iTunes the exclusive premium provider of movies and shows for all AT&T broadband subscribers, while disadvantaging Amazon Prime and Netflix. The Democratic National Committee’s site could be the exclusive premium political site on Comcast, with smoothly loading campaign ads, while the Republican sites would have choppy video. Google’s Chrome browser could be the exclusive premium browser application on these cable and phone systems, while Firefox and Explorer load just two seconds more slowly. Startups would never have the money to buy the exclusives and thus would be at a disadvantage. If we had this model years ago, we’d probably all be using Alta Vista not Google, MySpace not Facebook, and Digg not Reddit. And talk about a fast lane—the FCC is proposing to adopt these rules by the end of the year. The chairman’s proposal would authorize exclusives through the operative language in Paragraph 126 of last week’s proposal: “we propose to adopt a rebuttable presumption that a broadband provider’s exclusive (or effectively exclusive) arrangement prioritizing service to an affiliate would be commercially unreasonable.” Translation: The FCC is saying that exclusive deals between a “broadband provider” (this means Comcast, Verizon, or AT&T) and an “affiliate” (a company it owns or co-owns) should be presumed to be illegal, and the provider would have to prove otherwise. So an exclusive deal between Comcast and a site it owns, such as NBC.com, would be presumed illegal. There has already been massive backlash against Wheeler’s proposal—from 190 companies, 100 investors, 100 nonprofits, and hundreds of thousands of people. The backlash has been so bad that the chairman appears to be lobbying against his own rules—with rhetoric about his commitment to the open Internet that is completely divorced from the reality of his rules. One legal scholar has even called on President Obama—who campaigned aggressively on ensuring network neutrality—to demote Tom Wheeler from his chairmanship and elevate one of the commissioners who supports network neutrality. The truth is Wheeler seems to believe that the Internet should be like cable TV, where Comcast can determine which channels you get, and every upstart has to beg to be included. 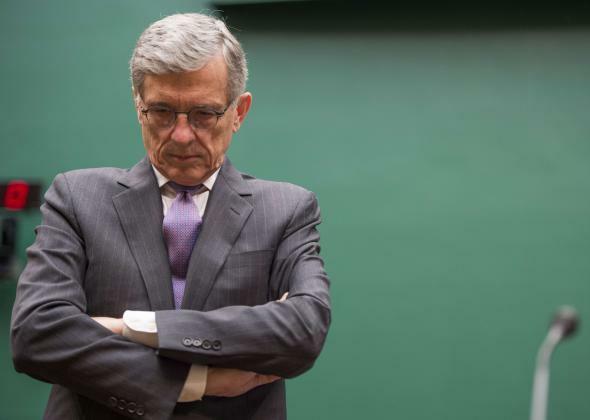 Wheeler’s rule envisions such deals for the Internet. For example, Wheeler’s proposal even asks whether the FCC should judge exclusive deals by using factors in the (completely ineffective) cable rules. This too is legalese, but I will include two of the five, since it’s obvious that no startup could afford the lawyers and expert witnesses to challenge an exclusive deal under these vague factors: “(i) the effect on the development of competition in local and national multichannel video programming distribution markets; … (iii) the effect on the attraction of capital investment in the production and distribution of new satellite delivered cable programming.” This is footnote 259 of paragraph 128, if your lawyer—not that you have one—happened to miss it. So to sum up: The FCC is not only giving the phone and cable giants the power to control winners and losers on the Internet, it’s proposing to empower them to create one permanent winner in every industry. If adopted by year-end, it would not be a net neutrality rule but net monopoly rule. This would undermine the consumer-driven innovation we have seen across every sector thanks to an open Internet—an openness that the president and his FCC chairman have both promised to protect. Disclosure: The author is a lawyer who has advised startups and nonprofits on net neutrality issues.